At least one person was taken into custody Tuesday after a standoff in the 2200 block of Gallagher Avenue. 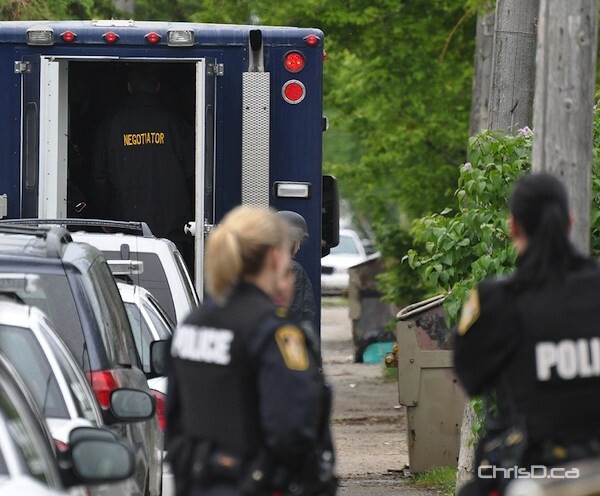 The Winnipeg police tactical unit responded to an area residence at about 2:30 p.m. and ordered the occupants out with a megaphone. When they didn’t comply, officers used force to enter the home. About 10 cruisers responded to the scene, which witnesses say was the home of an alleged pot dealer. Nearby streets were blocked off and neighbours were cautioned to stay inside. Witnesses said police seized a sawed-off shotgun and other weapons. Police weren’t available late this afternoon to provide further details. Streets were reopened by about 5:30 p.m.
UPDATE: Wednesday, May 23 — Sheldon Lee West, 29, has been arrested and charged in connection to this incident. Winnipeg police seized several firearms, cash, marijuana and drug paraphernalia from the home. West was arrested in the area of the 1400 block of Logan Avenue shortly after 2 p.m. before officers executed a search warrant on the residence.